This week the forest has been full of mums and dads! It has been lovely to show them what we love to do every day in the forest. We have kept them busy cooking in the mud kitchen, balancing on the slacklines and reading books with us. Many of the parents commented on how calming it felt to be out in the forest. We have been busy with creative projects this week inspiring the budding artist within us all. The week started with finding a variety of logs in various interesting shapes. We dug holes deep enough to ensure that the logs were sturdy when placed upright. Surprisingly they even held the weight of the children! The following day we introduced wool to decorate the logs by wrapping them up, similar to some art pieces created by real artists for exhibitions. The children enjoyed winding the wool around the branches and talked about giving them dresses and clothing to keep warm now that the weather is getting cooler. The leftover wool quickly spread throughout the forest, weaved from tree to tree like a giant colourful spider’s web. It was hard to see the forest through all the wool! The children began to create their own games as they engaged with the wool together and individually. For one particular child, a ball of wool and a stick were the necessary tools to create a ‘baddie caughter’, a perfect trap for luring in unsuspecting baddies. Their engagement and focus was so strong that even the lure of lunch wasn’t strong enough to tear them away from their creations. The next day our art skills were unleashed on the forest again, but this time with paint. The morning saw us busy creating our very own forest paintbrushes! Simple and inexpensive, made from sticks, feathers and ferns. 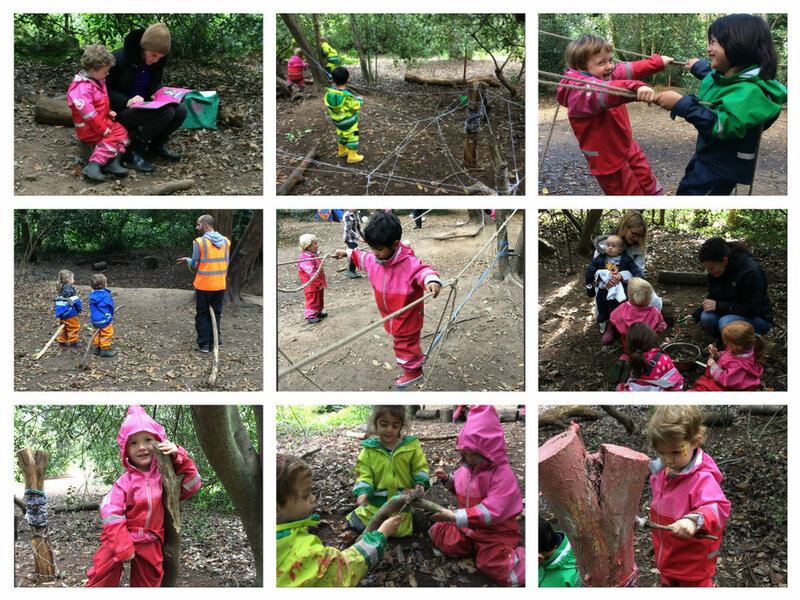 The children were set the task of finding the necessary materials on the forest floor to make their own paintbrushes. We were very impressed with the results, and the children were busy painting all morning, even returning in the afternoon to finish the job. This was a great chance to explore how the colours changed as they were mixed and how new colours could be created. Other children noticed that the red and green when mixed together turned brown. The children created with a vision and spoke about their art. A group of children worked together to create a rainbow apple tree. It was fantastic to see them sharing paint, working collaboratively alongside each other, giving instructions and directions when needed, and conversing as they painted. Inspired by their art, the children began to make up their own songs as they worked. ‘I love pink, I love pink’ caught on quickly and they sang in tune as they worked, changing the colours as they went. We can’t wait to see what next week brings.